A United States diplomat disappears in front of hundreds of onlookers while attending a religious ceremony in the bushveld of Zimbabwe. Dominic Grey, Diplomatic Security special agent, product of a violent childhood and a worn passport, is assigned to investigate. Aiding the investigation is Professor Viktor Radek, religious phenomenologist and expert on cults, and Nya Mashumba, the local government liaison. What Grey uncovers is a terrifying cult older than Western civilization, the harsh underbelly of a country in despair, a priest seemingly able to perform impossibilities, and the identity of the newest target. Himself. The first work in a globe-hopping series whose protagonists investigate the world’s most bizarre and dangerous cults, The Summoner is a stylish, haunting novel of mystery and suspense that will linger long after the last page is turned. It is quite a while for me to read a thriller type of books. I love these kind of books, but the problem is, I cant put it away to stop for a while. If I do that, I would be so frustrated. One thing for sure, a thriller books need your attention more than anything. It's grabbing you and you cant abandon it just like that, like continue reading it later. It will kill the mood totally. 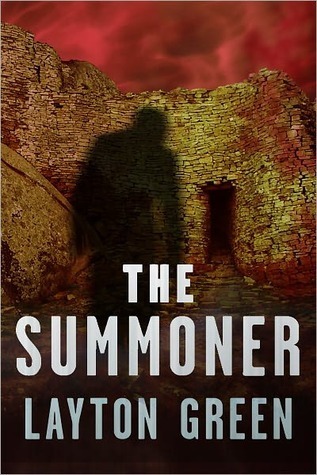 Layton Green's novel The Summoner is one of those thriller books to die for. Yes, it is complicated, action-packed and attention grabbing. If the book provide these kind of things, why would you stop reading and continue later. Such a waste. The plot is thrilling, so intense and made me nervous every time I flipped the pages. Plus, Zimbabwe as location of the story, is something very very interesting. I always find Zimbabwe as an exotic place. As the story deepens, so many secrets that are so intriguing and I kept asking why and what? It's predictable for me because there must be a twist and turns at the end.Of course I am right and always being surprised of the twists. However, I think the characters are so-so, not really that developed like the story. Everything was there, but I dont think I know the protagonist that well, and something missing about other character as well. That being said, I think the book has a good package of good thriller book, excluding the character flaws. A recommended read for sure. In addition to writing, Layton attended law school in New Orleans and was a practicing attorney for the better part of a decade (even though he still resents having cut his hair for that first interview). He has also been an intern for the United Nations, an ESL teacher in Central America, a bartender in London, a seller of cheap knives on the streets of Brixton, a door-to-door phone book deliverer, and the list goes downhill from there. He has traveled to more than fifty countries, lived in a number of them, and has a burning desire to see every country, city, beach, moor, castle, cemetery, twisted street and far flung dot on the map. Religion and cults, as well as all things spiritual and supernatural, have also been a lifelong interest. Note: I got a copy of the book in exchange for an honest review. It's a long due review. My apology.